Love lasagna but don’t have the time to make it?! It’s ‘Skillet Lasagna’ to the rescue! 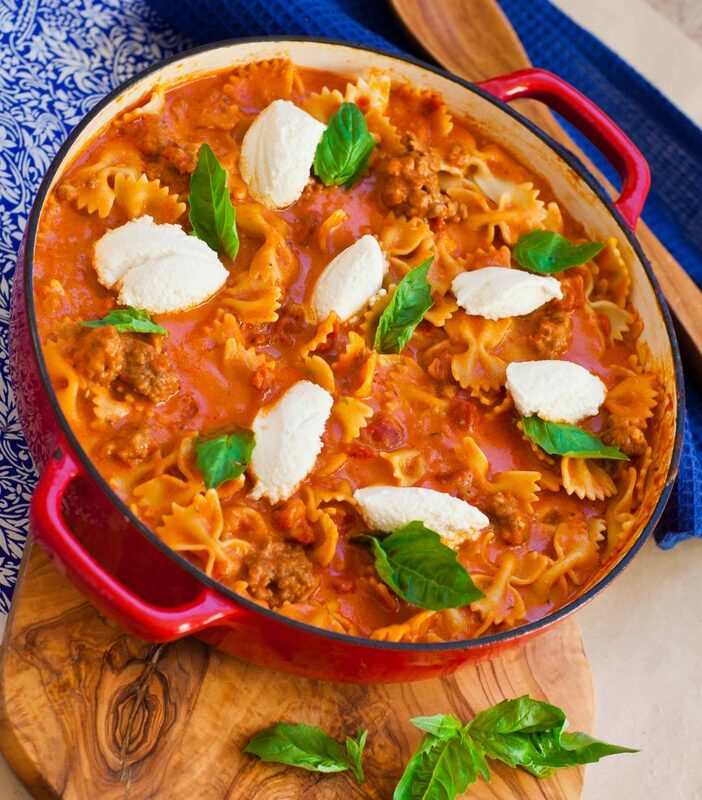 Get all the flavors you love in this easy to make pasta dish using my favorite meat sauce, mozzarella and ricotta cheese! This is perfect for a busy week night and comes together in no time! I use the same delicious meat sauce for my traditional lasagna recipe. It’s the one and only recipe I ever use – there’s no need to change when this one is perfect! It’s easy to make and incredibly flavorful. And the longer it cooks, the better it gets! If you have the extra time, cook the sauce for about an hour or even two for maximum flavor. You’ll get to enjoy the delicious aroma of the sauce cooking away; it’s one of my favorite aromas, especially in the fall season! For serving, add dollops of whole milk ricotta cheese and fresh basil leaves on top. The extra cheese adds a bit of needed creaminess and I love the vibrant color of basil with all my Italian pasta dishes! Prepare pasta according to package instructions and set aside. Preheat a large saute pan over medium heat and add a splash of olive oil. Add the Italian sausage and use a spatula to break apart the meat into small pieces as it browns. Once meat is browned, add the diced onion and minced garlic. Cook until the onion is tender and translucent, about 3 minutes. Next, add all the seasonings: salt, sugar, oregano, thyme, rosemary and fennel seeds. Stir until well combined. Add the balsamic vinegar, red wine, beef broth, tomato sauce, tomato paste and diced tomatoes. Stir very well, combining all the tomato sauce with the meat. Bring the mixture up to a simmer, cover with a lid and cook over low-medium heat for 20 to 60 minutes; the longer the better! The sauce will develop more flavor the longer it cooks. When sauce is ready, add the mozzarella cheese, parmesan and cream. Cook until cheese is completely melted, then remove from heat. Add in the prepared pasta and toss in the sauce until well coated and combined. 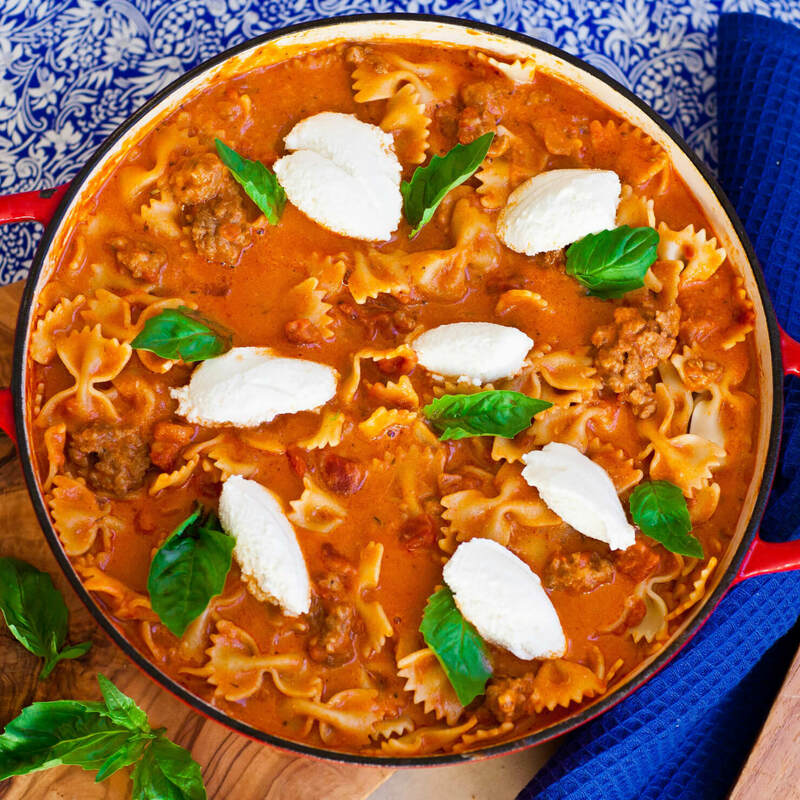 When serving, top the pasta off with scoops of ricotta cheese and garnish with basil leaves. Sooo amazing! Easy to make, a huuuge hit with the entire family! I texted the link to all 4 of my sisters! Thanks Tatyana for always coming through with great, easy meals! This dish was a huge hit at our dinner table tonight. Simple yet so flavorful! That’s awesome! 🙂 So glad everyone enjoyed it!